On 15th February 2016, Gwen Richards and I were re-visiting a new site for hart’s-tongue fern at Achmelvich that she and Pam Mackenzie had discovered two days before. 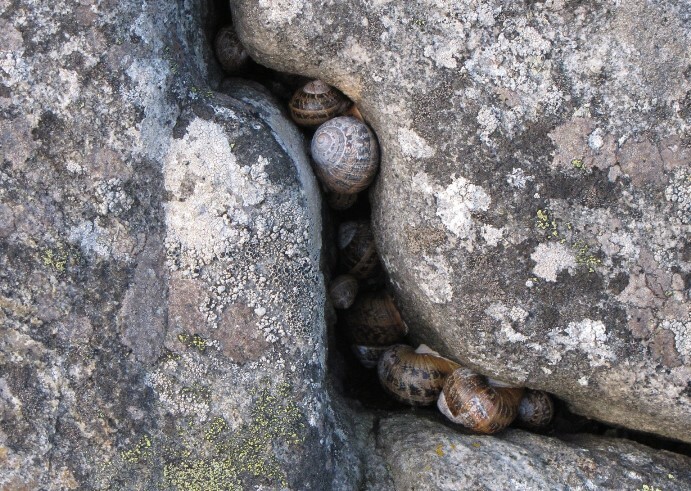 Nearby, between the path to Alltan’abradhan and Vesteys’ Beach (NC0625), we came across a cluster of garden snails Cornu aspersum wedged into a crevice in the gneiss bedrock, with other such clusters not far away. These are the snails’ winter quarters, where they wait out the cold weather, the apertures of their shells sealed with a tough membrane. I was quite surprised to find this species so far from human habitation, with which it is usually associated, and also present in such numbers. A recent distribution map on the NBN shows the garden snail as sparsely distributed in the north of Scotland, and almost entirely restricted to the coast. However, we do know that the species is quite widespread in the parish, again mainly around the coast, and that it can occur in pest proportions on fertile croft in-bye, as at Clachtoll. 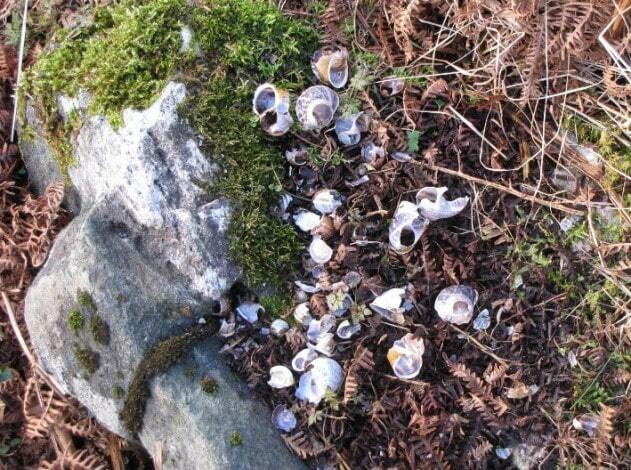 Not far away, we spotted a litter of broken snail shells on a large, flat, stone in an old wall. This was a thrush’s anvil, where a song thrush had broken the shells to extract the animal inside. Amongst the garden snail shells were those of two other, slightly smaller, species, the white-lipped snail Cepaea hortensis and the copse snail Arianta arbustorum. All are nutritious additions to the diet of a thrush, especially in the winter; they hide away from the weather and predators, but the thrushes seek them out.